Personalized Subliminal MP3s. "For Your Ears Only"
Personalized, custom made subliminal mp3s tailored to your own specific needs. Reprogram your subconscious mind and improve your life with an mp3 audio created just for you. Imagine listening to your favorite song and transforming your life at the same time. I can make this possible for you. Your favorite music can be transformed into a powerful tool to achieve your goals and improve your life if the appropriate subliminal affirmations are recorded in the background of the music. You will be enjoying listening to your favorite song as usual, but your subconscious mind will be receiving in the meantime the subliminal messages that will allow you to reprogram your mind towards your goals. Why use subliminal affirmations and not just positive thinking affirmations? How do you reprogram your subconscious mind with a subliminal mp3? Subliminal mp3s are certainly a pleasant way to use self-hypnosis to your benefit. They are maybe the most enjoyable way to use the principles of hypnotherapy, neurolinguistic programming (NLP) and the law of attraction together to overcome subconscious limiting beliefs and transform your life in an easy, practical way. Subliminal recorded messages are powerful. The beauty of them is that they bypass the conscious resistance of the rational mind speaking for the subconscious that often "filters" the positive affirmations through disbelief or negative inner talk. Subliminal mp3s are designed to allow the positive affirmations to be received and acted upon directly by the subconscious mind. The subliminal messages cannot be heard out loud by your rational mind while the music plays, but your subconscious mind receives them directly. So while you listen and enjoy your favorite song, your subconscious mind is at the same time receiving the subliminal messages that allow you to reprogram your mind towards your goals. You are working on your subconscious mind while you enjoy listening to music. What are the benefits of a personalized, custom made subliminal mp3? 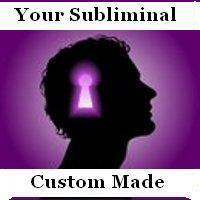 A personalized subliminal mp3 is tailored to your own specific needs, wishes and goals. Therefore it can be as detailed and as specific as you need it. It is about you and what you want to change and improve in your life. •You choose the features for the recording. With your choices, I will make it happen and deliver it to you by email, in mp3 format, for your ears only. How does it work? How do you order your personalized subliminal mp3? 1. The affirmations you want me to record on your subliminal mp3. a) You can draft the full script -as simple or detailed as you want it- and send it to me by email. I will record the affirmations you want. b) If you need help drafting your script, send me a note describing your desires and I will draft a script for you. I will submit it to your review via email before I record it. c) You can also send me your affirmations recorded with your own voice. Just go online to vocaroo.com, plug in a computer microphone to your PC and record it. Then send me the link or the mp3 via email. I will add the music, the frequency (Alpha or Theta) and make it subliminal for you. 2. The music you want me to use for the subliminal mp3. a) If you have a favorite song -any song you love- send it to me as an mp3 attached to your email, so that I can work with it. Preferably an instrumental song. b) Otherwise, you can choose any of my songs. You can previously listen to my music on my healing meditation music page on this site. c) You can also leave it to me. In this case, I will use my song "Peace", or any other instrumental song of mine that suits your script. 3. How you want the the positive affirmations on your subliminal mp3. a) You can choose subliminal affirmations only (you will not hear them out loud but only hear a gentle whisper in the background). This option is good to bypass the resistance wall of the rational mind speaking for the subconscious. b) You can choose to hear the affirmations out loud only. This option does not bypass the rational mind resistance. But if you want to focus on the affirmations consciously, they can work for you as long as you deeply feel the meaning behind each message as real. Otherwise, choose option (a). c) A combination of (a)and (b). You can have the affirmations out loud in the first part of the recording (along with the music) and silent (subliminal) in the second part of the song. 4. With or without special brainwave frequencies? a) You can choose no brainwave frequencies added, just the music and the subliminal affirmations. This option is good if you plan to listen to the mp3 several times per day or when you want to play it in the background when you are doing something else. b) With an Alpha frequency added. This is a good option if you want to be induced into a relaxed state and plan to listen to the subliminal mp3 twice a day when you are undisturbed in a quiet atmosphere (preferably before sleeping and first thing in the morning) but not while you are driving or doing something that requires your full alertness. c) With a Theta frequency added. This is a good option if you want to be induced into a deep meditative state and plan to listen to the subliminal mp3 twice a day when you are undisturbed in a quiet atmosphere (preferably before sleeping and first thing in the morning) but not while you are driving or doing something that requires your full alertness. You might feel sleepy or even fall asleep during the recording, but the subconscious mind will still be receiving the subliminal messages. Keep in mind however that the rule of thumb is to listen to brainwave frequencies for no more than one hour per day, so if you plan to sleep the full night with the subliminal mp3 recording playing on loop, choose option (a) instead. 5. Any other specific requests (optional). (a) Language. The default language for the affirmations is English. But if your mother tongue is Spanish or Italian, you can choose to have the affirmations in one of these languages (I am fluent in them). (b) Special healing sound engineer features. You may want to improve the sound quality of the song you send for your subliminal mp3. Or you may want to adjust the song frequency to a healing frequency like the 528 Hz love frequency. Or you may want to add additional sounds to the song (e.gr. sea waves, bells or bird singing sounds). Or to add a frequency that resonates with a meridian or body organ you want to heal. This way your favorite song becomes healing music, combined with transformational subliminal messages for your subconscious mind. All in one mp3. When and how do you receive your custom made subliminal mp3? As soon as I receive your payment and your message with your affirmations and specifications, I will answer your email and start working on your personalized subliminal mp3 recording, which will be sent to you as soon as it is ready (usually between 2 and 5 days) in high quality mp3 format, directly to your email address. Once you receive your custom made subliminal mp3, you will be able to listen to it on your PC or Mac, transfer it to your iPod, mp3 player, iPhone, Blackberry or any other smartphone, or burn a personal CD to listen to it on your home stereo. The use of good headphones is highly recommended to benefit the most from your personalized subliminal mp3. BEFORE YOU PAY FOR YOUR ORDER, CONTACT ME FIRST and send me all your specifications HERE about your script, the music you want, the brainwaves and -if needed- any additional sound engineer special features. Then, as we establish contact via email, I will let you know when to pay to place your order before your subliminal is delivered to you.